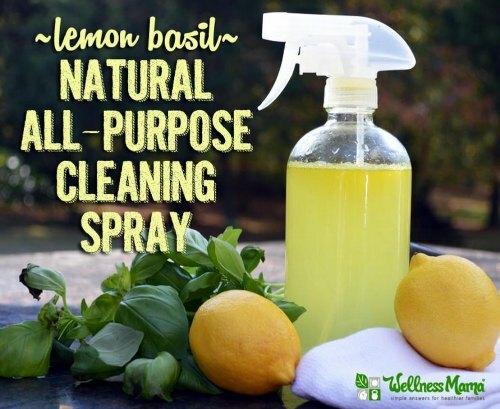 There are many reasons why making your own lemon basil natural cleaning spray at home is a wise choice compared to buying store bought products. It can be anxiety provoking to bring home products that are full of chemicals and hazardous compounds that can have devastating effects on your family if accidentally ingested or consumed. The piece of mind that is experienced from making your own all natural cleaning spray is truly second to none when it comes to protecting your family. Plus, incorporating all-natural cleaning products into your home doesn’t have to be a hassle. Making your own lemon basil natural cleaning spray is a task the whole family can be accomplish without worry. The clever tutorial we’ve discovered provides you with a safe and easy recipe that will only take you a few minutes to mix together and will have your home smelling wonderful and citrusy as it safely cleans. It’s a homemade all-purpose cleaning spray that you can use on any surface in your home for almost any spill or mess that needs cleaning. Since it’s all natural, you won’t have to worry about kids or pets coming along and picking up residual chemicals that may have been left behind from cleaning agents that are not all natural. This could even be an opportunity to nudge the kids into new chores or responsibilities around the home. A quick trip to the store is all it will take to start making your own natural cleaning spray at home. Safety is the first concern in any home and making this all-natural product is one more way you can ensure that your family and the environment around them is as safe as possible. This method is not only safe and environmental friendly but it will save you money in the long run.